The ultimate guide to Bad Kleinkirchheim ski holidays. The clue’s in the name: ‘Bad’ is used to describe spa towns in German and people have been coming here since 500BC for the thermal baths and local produce (apparently Cleopatra used to import her cosmetics from the region...). ‘Kleinkirchheim’ translates to ‘little church home’, which sums up the resort rather nicely... Intermediates will have a field day on the mountain and the après ski is just how we like it: friendly, merry and traditional. The ski resort is founded on an ancient Austrian spa town in the Nock Mountains, in Southern Austria’s state of Carinthia. Pronounced ‘Bad-kline-kursh-hyme’ and nicknamed BKK (possibly for ease! ), the town’s first recorded mention was as early as 1166 and it has a long and interesting history as an Alpine wellness destination. The area’s popularity with snow lovers has grown since the first ski lift was built in the fifties. You’ll struggle to find a description of this place where Franz Klammer doesn’t pop up – this is where the Downhill Champion honed his skills and there’s even a downhill named in his honour. FIS Ski World Cup downhill events are regularly held here, including the ladies downhill race in 2015. The great thing about this as a ski destination is the balance: you’re surrounded by ancient architecture like the gothic St. Catherine’s Church, without forgoing the mod cons you’d want from a European ski holiday, including access straight from the town to the piste. The wellness facilities throw some serious R&R into the mix but this isn’t the quiet mountain village it first seems – the après in the bars and taverns actually gets quite lively. The standard ski pass will keep you plenty busy on the slopes here and in neighbouring St Oswald, but if you’re feeling particularly adventurous and don’t mind the commute, the Top Ski Pass covers 80 ski areas in Carinthia and East Tyrol and a mammoth 877km of ski slopes. The resort has good bus links to neighbouring villages for anyone who wants to explore when the boots come off - head to Field Am See to catch a glimpse of the wildlife you rarely see when whizzing down a piste. Slovenia and Italy are only an hour or so away by car if you fancy packing the passport for a day trip somewhere different. View our detailed Bad Kleinkirchheim snow forecast or snow report and see all live webcams, piste maps, road and travel maps and lift pass prices. For a picture of historic snow conditions see the snow depths month by month with our Bad Kleinkirchheim snow history. The nursery slopes are in the village, so beginners don’t have to go far to find their ski legs, with schools like Skischule Brunner providing instruction. A handful of blue runs will keep beginners busy – the long Priedröfabfahrt is one of our favourites as it winds through the pines with great views of the surrounding mountains. Intermediates can roam the whole area: take the Kaiserberg lift to the top station for a choice of reds all the way back to the village – the FIS K-70 is one of the best and longest (it used to be the men’s downhill route). Take the left route when the run splits into two and when you reach the bottom, you can hop back on the Kaiserberg lift up to the middle station for more options. From Strohsack, ski the red Maibrunn all the way down and then cross over to St Oswald for super slopes like the Brunnachabfahrt, which makes for an exciting ski through snow dusted pines. There’s tonnes to keep an advanced skier in their bindings. Of the black runs, our top picks are the Muldenabfahrt at the top of the mountain (the steepest in resort) and the World Cup Franz Klammer piste, where you can ski in the tracks of the man himself all the way back to resort (sometimes the tourist office to a program where you can race the man himself!). The Kaiserburg top and middle stations give access to some good off piste through the treeline – hire a local guide to show you the very best of the area or book private lessons with one of the ski schools to learn the technique. If you’re more park than powder, the snowpark (served by the Panoramalift) is crammed with features of different difficulties to test and thrill. A number of family-run taverns like the Hübelbauer serve local specialities made with home-grown ingredients. Grab a pizza in Gasthof Sportalm (super for families as it comes complete with outdoor play area). Having won multiple culinary awards, the Lindenhoff is great for a special occasion if you fancy sampling some of Christian Regittnig’s gourmet wonders. 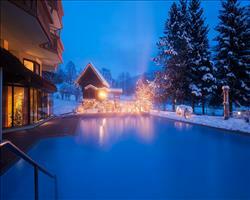 We’d forgive you for sidestepping the après bars in light of the après spas here... The main ones at St Katherin and Römerbad are lovely for a relaxing swim, steam or sauna (as well as a multitude of treatments) and both have special areas for families too. The resort often gives you the chance to buy and swap spa tickets with your lift pass – worth looking up before you book. When is the best time to ski Bad Kleinkirchheim? The ski season usually runs between December and April. With the ski area covering grassy pastures, it needs less snow cover than ski areas on rocky terrain to be skiable – good news for the start of the season. There’s also a lot of tree-lined skiing if visibility is poor. If more snow’s needed and the mercury level’s low enough for the 800 snow cannons to do their jobs properly, an impressive 97% of the ski area can be covered. For the best sunshine, head to the sunnier slopes on the St Oswald side. The north facing nature of the other side of the ski area is great for the later season, where the shade means less slushy skiing. Taking the Kaiserburg cable car will get you to the highest point in the resort at 2055m – which should be your best bet for snow conditions later in the season. Look up the tourist office’s calendar of events - in recent years, there’s been the chance to ski with Franz Klammer himself before the lifts officially open on certain dates of the season. Families who have been skiing for a few years already will be most at home here – nearly all the area is graded red and above. If you are bringing beginners, the ski schools operate from four different locations around resort, so you won’t have to worry about the convenience of dropping off and picking up. The nursery slopes are at the heart of resort and have features like magic carpets, to help the youngest skiers find their feet. Blue number 17 is a nice long one to ski as a family once the nursery slopes have been conquered – winding all the way from top to bottom through fairytale pine forests. In past years, the ticket office have run a ‘family euro’ deal, where an under 12’s ski pass only costs €1 a day when bought with an adult 6 day pass. Kids equipment hire deals aren’t unheard of either, so if offers like these are still running in resort (we hope so!) a week here can be great value for money. With spa hotels – with all the trimmings – complete with playrooms and WiFi, grown-ups, little ones and teens will find plenty to do without even going outside. The Römerbad and St Kathrein thermal baths, which the resort is famed for are open to adults and children alike - swimming outside surrounded by snow is a beautifully baffling experience for youngsters (and some of us older ones too). There’s no shortage of snow themed activities to get involved in either - skating and tobogganing are two favourites (you can actually toboggan above the pistes) but if you want something really special, book a horse drawn sleigh ride through the snowy pines. The fact that this is a ski town AND a spa town opens up a lot more opportunity for group holidays (and the après ski in the local taverns isn’t bad either...). Groups of intermediates will do best here with 85% of the area graded red. Experts can challenge each other to zip down the Franz Klammer downhill track or head to the speed testing piste for some friendly competition. Book a private powder or mogul lesson with Skischule Brunner if you want to learn something new together – beginners can learn to ski with the same school. Non-skiers won’t struggle to find things to do in Bad Kleinkirchheim, so there’s no reason not to extend the invite to more people. Head to the St Kathrein and Römerbad thermal baths for swimming, wellness facilities galore and a long menu of spa treatments. If you can tear yourselves away from the pampering, the resort has lots of history and it’s well worth paying a visit to historic sites like St Catherine’s Church to clue up on the local area. Tobogganing is a great way to enjoy the snow as a group - hurtling down the run at Wöllaner Nock (accessible by the Kaiserburg cable car), gives skiers and non-skiers alike the chance to reach the highest point in resort. Grab a drink in any of the bars when you’ve finished on the slopes – gather with a glühwein round the fire pit at the Einkehr under the stars or check out the Take Five nightclub if you really want to let your hair down. "A beautiful place, would be amazing with good snow"
On the first day it was too foggy to ski, which turned out to be a good thing as we ended up taking the ski bus all over the place to get our bearings. It’s a peculiar place but once you know what you’re doing it’s fine - at first you wonder whether there’s anything more than your hotel and a small chairlift on the road, but after exploring it’s quite a huge area. There isn’t really a centre like normal ski resorts, the village is stretched in a way all along one road. It’s the most beautiful place, I’ve never seen anywhere as beautiful. There are some really old wooden buildings, decorated with ribbons and pine cones. We’d never been to the south before but it’s such a lovely areas, even the journey from Salzburg passes a lake that’s just spectacular. There was no snow in the village and there isn’t much to do in the evenings, but we had a lovely stay in the Trattlerhof. A lot of people ended up walking which would have been nice. 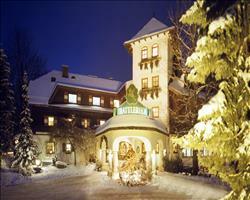 Bad Kleinkirchheim is a spa town with 2 thermal spas. When it rained on the Thursday we went to one of the spas, but it wasn’t really our cup of tea and we got bored quite quickly. I’m sure many others would have enjoyed it though. We struggled to find a piste map, and when we eventually did it wasn’t a very good one. However if it had been snowing and the snow had reached the base, it must be the most amazing place to ski as a lot of the pistes came down into the village. "Amazed how all the pistes were open"
When we arrived in Bad Kleinkirchheim everything was green but amazingly the resort kept everything open – you looked out onto green fields with snaking lines of white. There were snow cannons up on the mountain but even the cross country course down at the bottom of the valley was open, they must have trucked in lorry loads of snow and built it up because not a single run was closed. We’re used to skiing in France, where in the purpose built resorts everything’s connected in a very extensive ski area. Here you have pistes on two sides of the valley with the village and main road in between. They could do with investing in the infrastructure as the area only has T Bars rather than button drags (I hadn’t seen a T Bar in years!). There was one connection between the two areas that went under the main road and used a tiny draglift (even this was kept open with snow under the bridge). The pistes include 4 blues (one of which is a tiny link used just to gain height) and 4 blacks and everything else is red, so this is definitely a place for intermediates. One of the blues is 6.7km long – it’s a long forest track in the summer which snakes its way down with hairpin bends (a smooth enough ski that I could hold my camera and film it all the way down) it was an absolutely brilliant piste. As an Austrian village, I imagined Bad Kleinkirchheim to be really scenic with the typical onion dome church etc., it wasn’t quite like this but it was still a pleasant place. 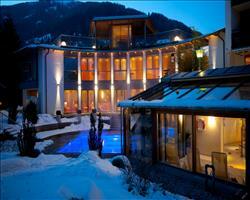 It’s predominantly a spa town with 2 main spas that were open to the public.